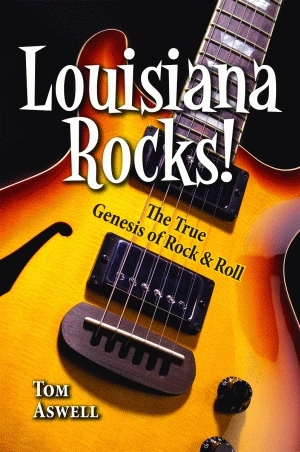 An expansive study of the beloved all-American music form of rock and roll, this in-depth history argues that rock and roll started in New Orleans in 1947 when Roy Brown recorded “Good Rockin’ Tonight.” With verve and the authority of a true expert, Tom Aswell considers the Louisianan influences of swamp pop, Cajun, Zydeco, R&B, rockabilly, country, and blues music to detail the ways in which these musical forms mixed and gave birth to rock and roll as we know it today. Louisiana’s musicians were making rock and roll history well before Bill Haley recorded the legendary “Rock Around the Clock” in 1955. In 1949, Fats Domino recorded “The Fat Man in New Orleans,” and Hank Williams, living in Bossier City, Louisiana, and performing on the Louisiana Hayride, introduced what would become known as rockabilly with the release of “Lovesick Blues.” The rest is musical history. Including profiles of such iconic figures as Sam Cooke, Ray Charles, Little Richard, Elvis Presley, Etta James, Buckwheat Zydeco, Percy Sledge, and Warren Storm, the book also discusses the role played by independent recording studios and locally owned radio stations in the promotion of local artist and their music. Aswell presents the incredible story of rock and roll and its myriad Louisiana influences as it truly has never been told before. Tom Aswell is an award-winning journalist who worked as a newspaper reporter and editor for twenty-five years. His work has appeared in nine Louisiana newspapers including the Baton Rouge Advocate and the Monroe News-Star. A former disc jockey, he owned and coached a semi-pro baseball team and has worked for the State of Louisiana, Office of Risk Management since 1991. He lives with his wife in Denham Springs, Louisiana.